Spiders, fire ants, and mice, oh my! Some visitors you can avoid by screening phone calls or not answering the door. But others, such as insects and rodents, come in without an invitation and are in no hurry to leave. These organic pest control ideas will help you reclaim your space. It's hard to get kids to go outside these days. Gaming consoles, movies on demand, cable, video games and social media all clamor for attention. How do you get today's child out into the great outdoors? By making it fun! Your home is your most precious asset, and your lawn is, without a doubt, one of the things that make your home truly valuable. 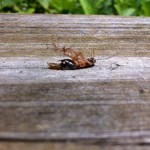 This is why pest control is so important. Uninvited guests, such as aphids and chinch bugs, can damage your lawn and gardens, ultimately lowering the value of your home. At Green Solutions Lawn Care & Pest Control you get a level of expertise that cannot be found anywhere else in Tampa. Green Solutions is the only Tampa area lawn care company that offers two owners with Bachelor of Science degrees in Turfgrass Management (Univ of Georgia, Auburn Univ.). You won't find another local company with that level of lawn grass expertise. At Green Solutions Lawn Care & Pest Control you get a level of service that you simply cannot get with the big name lawn care companies like TRUGREEN® and Scotts®. We have no 1-800 numbers to navigate just to get to your branch manager or technician. In fact it is not uncommon to actually get an owner on the phone to address your lawn and pest questions here at Green Solutions. You won't have a different technician on your lawn each treatment either. If you want to support a small, local company with a customer service focus, try us. What you should consider before you decide on a pest control company. When bugs find their way into your home, it can be quite unsettling. Don't let ants, spiders, and roaches freak you out. We can help, and we can do so quickly, in a way that won't make you lose sleep. Here are 3 reasons you should hire Green Solutions to take care of your bug problems. I clearly remember the first time I laid my eyes on Zoysia sod. 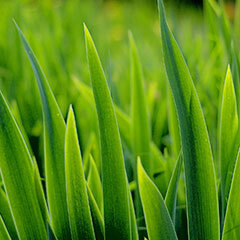 The fine leaf blades, the emerald green color, and the dense stand of grass made quite an impression on me. In the late ‘90’s I moved to Florida, and over the years I have seen Zoysia used on golf courses and in home lawns here. Interestingly, over the past several years in the Tampa area we have seen a dramatic increase in the frequency of Zoysia used in home lawns. One thing we know for sure about any turfgrass type is that there is both an upside and a downside. 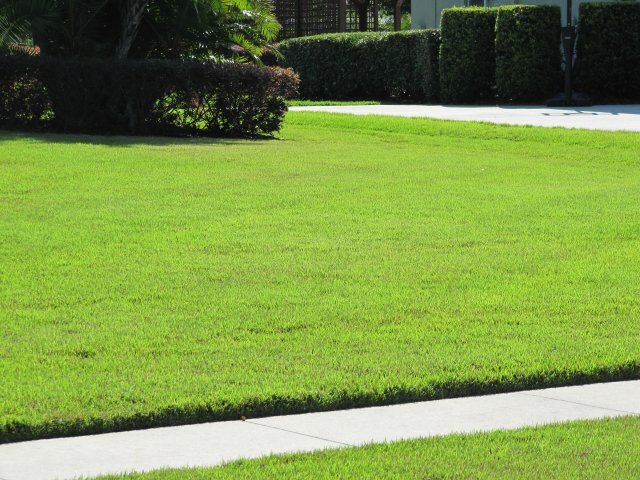 Let’s take a quick look at both the advantages and disadvantages of Zoysia grass as a home lawn in the TampaBay area. 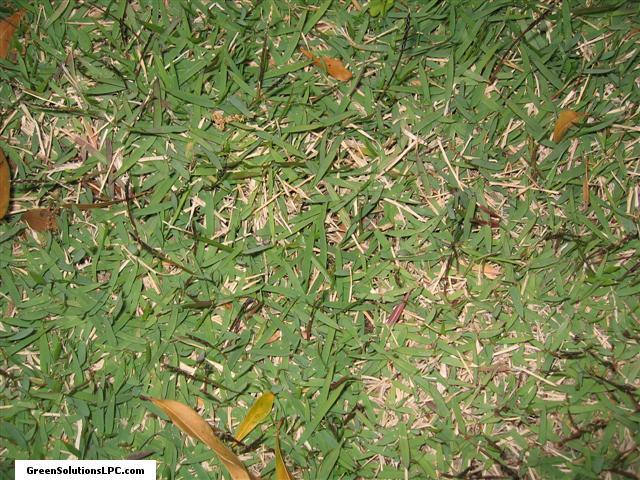 Above Zoysia grass is pictured in a Tampa, FL lawn. Photo taken in late Feb 2010 during very cold weather. What you need to consider if you have new zoysia sod. Some people learn the hard way that zoysia is not a completely perfect grass. It does have problems from time to time. Issues like fungus, soil pH management, over fertilization, and weeds can be difficult for an amateur to tackle. Like it or not, taking the do-it-yourself path is not the safest bet. You stand the best chance of protecting your investment by hiring a professional that has a proven level of expertise in zoysia care. Is Zoysia the Most Green Grass in Florida? 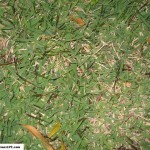 JaMur Zoysia grass is gaining popularity as a home lawn grass. It has some cool characteristics that have been driving interest in the cultivar, especially as the "Green" movement picks up steam and as drought conditions continue in the Tampa Bay area. The most significant of these characteristics is the turf's drought tolerance. In fact, the turf earned an acknowledgement from the Florida Green Building Coalition for displaying exceptional drought tolerance. If you are working towards a "Green Home Certification", the selection of JaMur Zoysia will now earn you certifying credits (Category Two: Water/Drought Tolerant Turf [2 points]). Is that a Worm Eating Your Lawn? 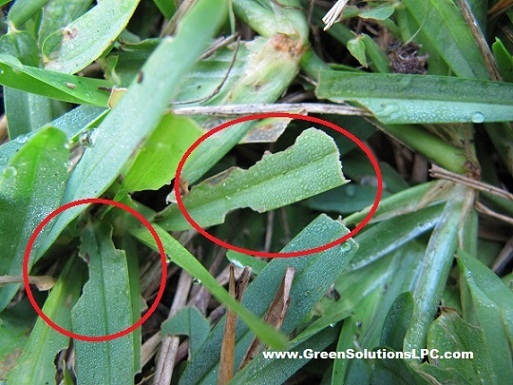 As turf-damaging moths fly over the lawn and landscape, they drop tiny eggs onto the grass canopy. 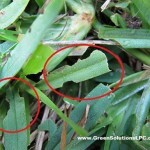 These eggs hatch into small caterpillars, and they begin to feed on the grass leaf blades. 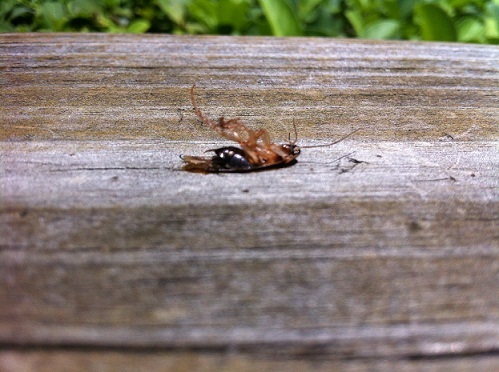 Eventually the worms pupate into moths, and the circle of life continues. Contact us today and receive a free estimate for any of our lawn care & lawn treatment services. 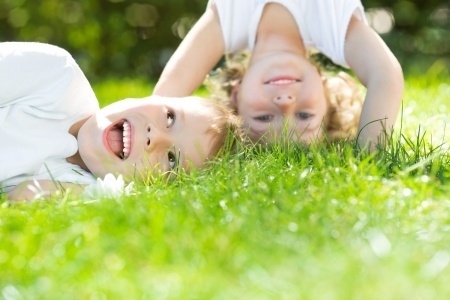 We are Tampa, Florida's number one provider for all lawn care and green pest removal services. Green Solutions is proud to offer our customers over fifty years of industry experience and is confident that we hold the solution to your lawn and pest problems. Our Staff is readily available to provide lawn and pest assessments and to make sound recommendations. 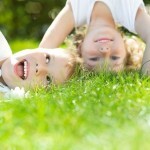 The best lawn care professionals in Tampa Bay, Florida. I use them every other month, and will continue to!